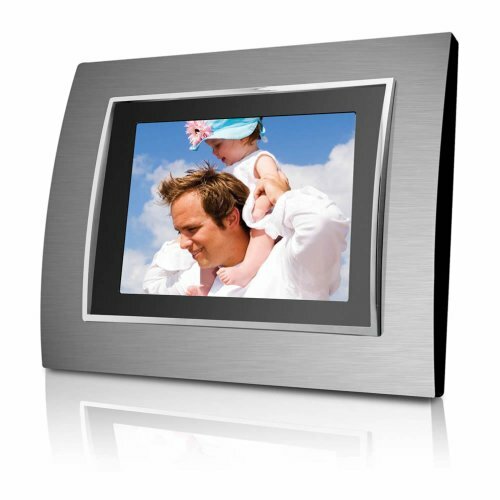 The new Coby DP-767 digital picture frame blends traditional functionality with today’s technology and design. Enjoy pictures, music and movies and capture your most precious moments with family and friends in a new vivid and engaging way. The Coby DP767 is perfect for home or office décor, and the contemporary brushed metal design offers a 16:9 aspect ratio for your viewing pleasure. For additional convenience, interchangeable faceplates and detachable stand are provided. A remote control is also included, allowing you to navigate the frame from your couch or office chair. Plus, you can now free up your hard drive: the Coby digital photo frame supports a variety of media formats including JPEG, MP3, WMA, AVI, MPG and XviD. Additionally, the Coby Digital Picture Frames is compatible with multiple memory formats, including SD, xD, CF, MS and MS Duo. With the widespread use of digital cameras, camcorders, and camera phones, the Coby DP-767 is the perfect product to store and share all of your special moments captured in digital media format. Includes an A/C power adapter, USB cable, detachable stand, interchangeable silver and brass brushed-metal faceplates, and remote control.